Well, I finally got around to posting these little fellas. You have probably seen many a bazillion versions of the melting snowman cookie, right? He is very popular, and rightly so! Well, did you know that the original "Mr. Melty", his proper name, was created way back in 2008 by Meaghan Mountford, The Decorated Cookie? Click on the link to read all about it. This is a simpler version, since it utilizes mini marshmallows for the heads and food markers for the arms. The cookie cutter is just a 1.5-inch round cutter and then the "melted snow" is applied freehand. I had so much fun making these little guys, and they came together quickly! I think they ended up pretty darn cute! 2. Use a 1.5-inch round cutter and cut out circles from dough. 3. Place on parchment lined baking sheet and bake according to recipe. 4. While the cookies bake, use the black edible marker to make the eyes and mouth of the snowmen and the orange marker for the nose. 5. After cookies cool, fill a pastry bag (fitted with a #2 tip) with untinted royal icing and free form the icing on each cookie to look like melted snow. 6. While the icing is still wet, place the head and the confetti sprinkles (buttons) on the icing (I used tweezers-for food only-to do this). 7. Allow cookies to dry overnight. 8. Use the black food marker to make arms on the snowmen. 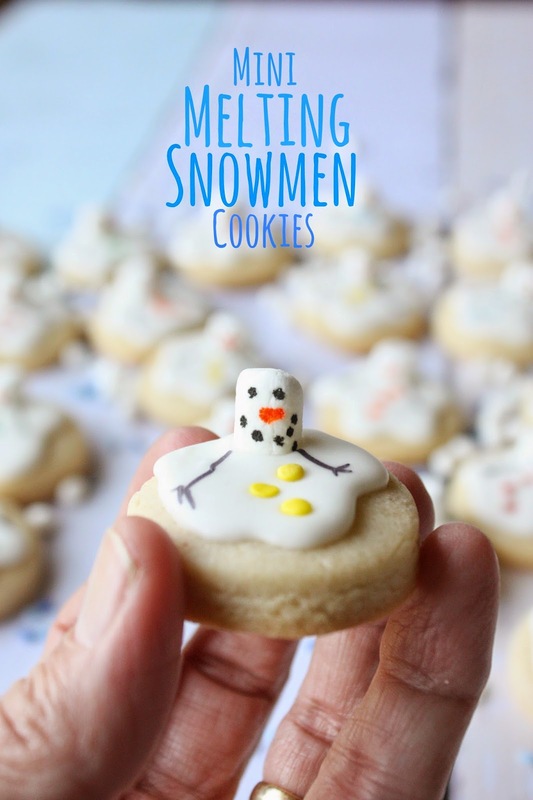 I love how cute this idea is, melt into my mouth snowmen! Oh my gosh! Absolutely adorable! These have been on my to do list for ages but I still haven't made them for some reason. Mini ones? Now I have to make them! They come together so easily, Erin! Your kids will have fun! I always want to make those adorable snowmen cookies. Save this for next year! Thanks for sharing, Sue. Great idea. These cookies are so cute! They look so delicious. Perfect for the cold winter days. Thanks for sharing the recipe. You had me at "mini"! Hope you are great! !